The company Norelem started out by specializing in equipment manufacturing before rapidly focusing on the design and production of standard components for all branches of industry, including precision mechanics (watch-making), automobiles, transport, aviation, defense systems and special machinery. 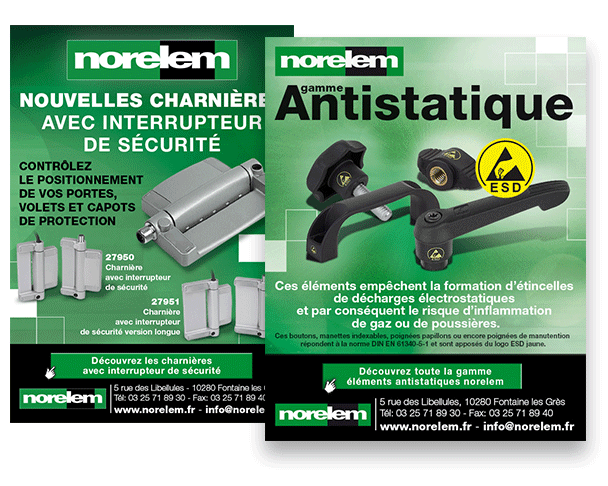 Norelem’s reputation among manufacturers is primarily due to its extensive range of standard components (close to 30,000 articles) and its high-quality products manufactured at its site in Fontaine-les-Grès in France’s Aube region. The company continues to pump considerable investments into its production site in a bid to guarantee a swift response to its customers’ needs. But Norelem’s reputation can also be credited to its Big Green Book (in reference to the company’s colors), a hardcopy catalog tipping the scales at over nine pounds and coveted by thousands of engineering firms. With updated versions released every two years, the catalog features a print run in excess of 10,000 copies and needs to be shipped due to its weight! In the 1990s, TraceParts was contracted to create and upload 3D catalogs of Norelem’s components. Models of Norelem’s components are now available at the www.norelem.com website and the TraceParts.com portal in all the main CAD formats on the market. To promote its Big Green Book, Norelem has been going through conventional communication channels, such as trade fairs, print media, banners on dedicated portals for design and engineering firms, and its blog atwww.blog-norelem.fr. Since March 2013, the company has been using TraceParts’ e-marketing services, especially banners on theTraceParts.com website and email campaigns targeting users of the download portal. TraceParts’ e-marketing services help put companies clearly on the radar (manufacturers, vendors, etc.) by sending their message to a community of over 700,000 qualified CAD users (85,000 in France), including buying managers, methods and maintenance departments, engineers, technicians and engineering firms, industrial manufacturers and executive officers. TraceParts also publishes banners on its portal and in its newsletter.